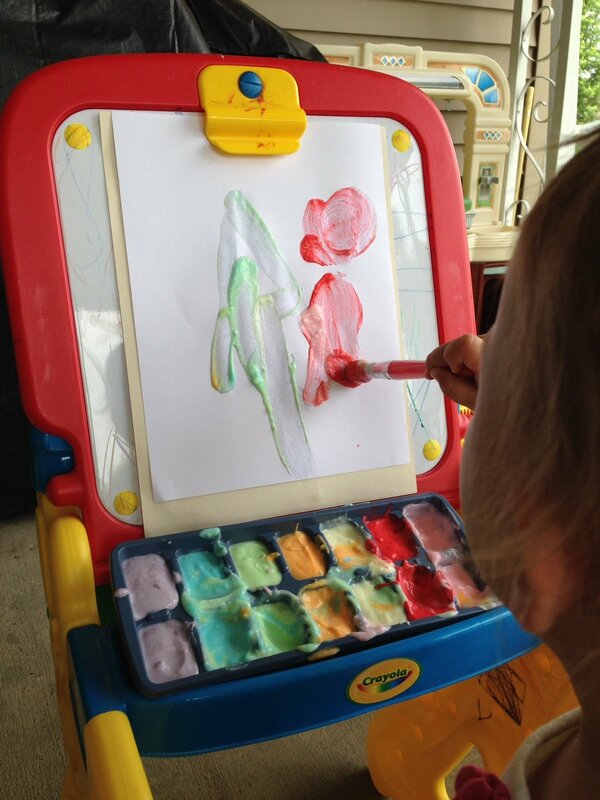 Preview: Let your toddler paint without having to worry that he/she will eat it! Edible yogurt painting is taste-safe and fun! Looking for toddler painting ideas but worried your little one will eat more paint than she gets on the paper? This toddler paint activity is taste-safe, colorful, and the perfect sensory activity for toddlers! What kind of paint can toddlers use safely? My 1.5 year old puts everything in her mouth. Not news to any parent, I’m sure, but this is a fact I have to take into consideration in every single part of my day. Anything within reach has to be child safe because she will either eat it herself or try to feed it to her three month old sister (who does not share her love of Cheerios or gold fish crackers just yet). I often feel like “mouthing” keeps her from doing activities so I try to find ways to make modifications in case of possible (ok, likely) ingestion. Recently we have been exploring arts & crafts which is a big challenge for the hungry girl that she is. I wanted her to try painting without spending the night in the ER so I had to make some kind of edible paint. I read about using food coloring in lots of different foods but I clearly recall an Easter-egg-coloring-disaster. It took days to remove all traces of the food coloring. I decided to use Kool-Aid powder in the packets. There is still some staining but I think it would be worse with food coloring. First I tried using baby cereal for the paint base. It is great for sensory because of the texture but it doesn’t spread very well. Yogurt seemed to be the better choice so edible yogurt painting was born! • Kid friendly paint brushes – little fingers work too! I started by putting about two tablespoons of yogurt in a bowl. Add a small amount of one packet of Kool-Aid mix (probably about 1/4 teaspoon- the powder is very concentrated). The more powder you add, the brighter the color will turn out but it didn’t seem to take much at all to get a good color. 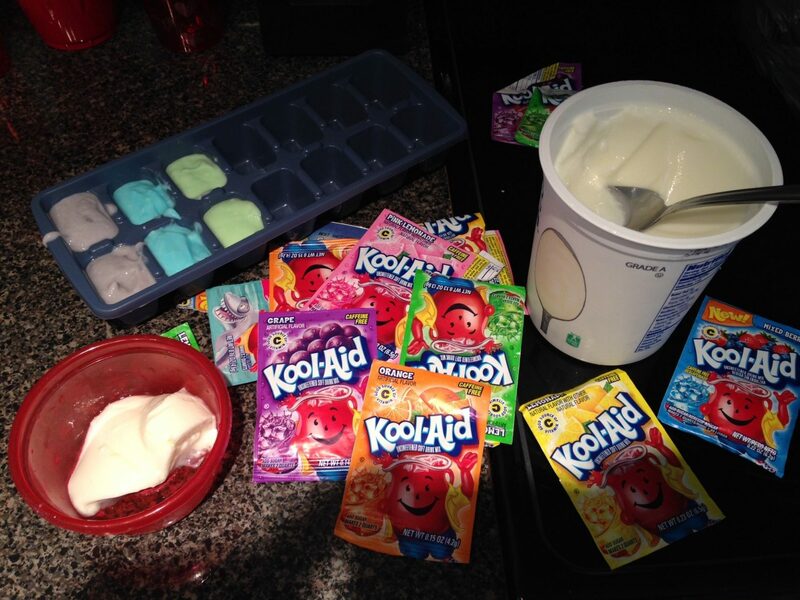 Mix and keep adding Kool-Aid powder until you get the desired color/brightness. Use a spoon to transfer finished “paint” to a slot in the ice cube tray. Rinse out bowl and start over to mix the next color. (Surely you can use different bowls for each color but if you are the one who has the do the dishes you probably don’t want to do that!). I tried mixing the colors right in the ice cube tray but I figured I would leave the “mess” part of the project to my daughter. If you are patient and have a steady hand, I’m sure you could mix colors right in the tray. I tried to have a full rainbow of colors but you may want to customize your tray to their favorites! Follow my Toddler board on Pinterest for more toddler ideas! Next I took everything outside where I could clean up easily with the hose. I set her up at the easel with her color tray and a paint brush. I tried printer paper and construction paper but both types allowed the yogurt to soak through. I just keep changing the paper to a fresh sheet. Honestly, she had more fun mixing the colors together in the ice cube tray than painting on the page. 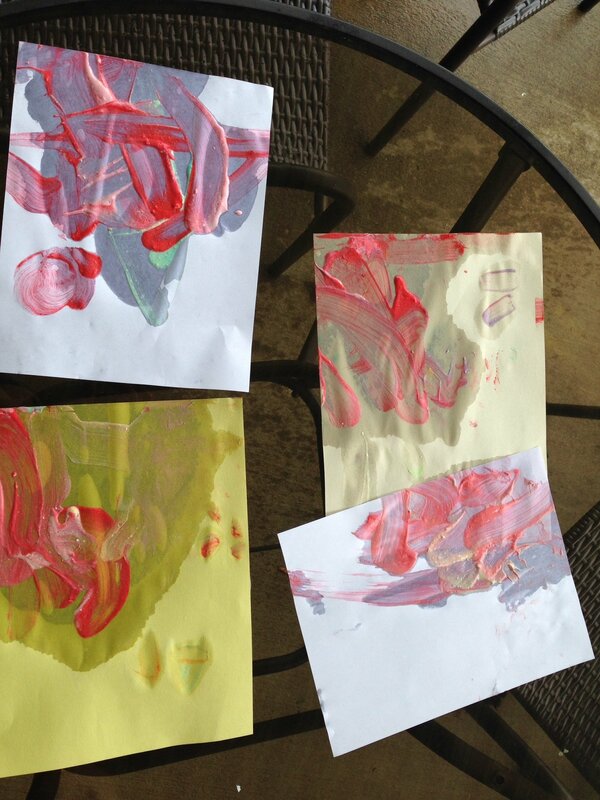 She even attempted finger painting which I was glad about because that way it became a great sensory activity as well… especially when she ate the “paint” (I knew she would)! I tried to encourage her to do paint trails (dragging one color at a time across the page) and to make fingerprints. At this age she has a mind of her own and a short attention span so I just let her experiment. This was a great Mommy & Me activity! I did try to discourage paint eating so that we can someday move on to real paint. Overall it was a good experience. The prep is quick, the clean-up is easy, and she had fun! -The brighter the colors the better they show up on the paper. This seems to be common sense but it did not occur to me until she was painting. Since the yogurt is watery, it makes the colors harder to see. Try using thick paper or even cardboard. – These masterpieces don’t keep well so you probably won’t be hanging them on the fridge. Instead, you can always take a photo of the works and make a collage or photo book of everything your little Michelangelo creates (without having to store a zillion pieces of paper). -Kool-Aid did cause some staining to her fingers. I still think it would have been worse with food coloring. Either can be used- just a personal choice (Kool-Aid smells better). Watching my daughter paint is a happy place. Watching your child explore a world still very new to them will always be a happy place. At 1.5, I try to take in these small moments, when she is innocent and calm, as temporary as it may be. I know your little one is a treasure and I hope you have a happy place moment with yogurt paints! Looking for another toddler activity? How about Paper Roll necklaces! Do you have an activity that you modify so your toddler can enjoy it too? 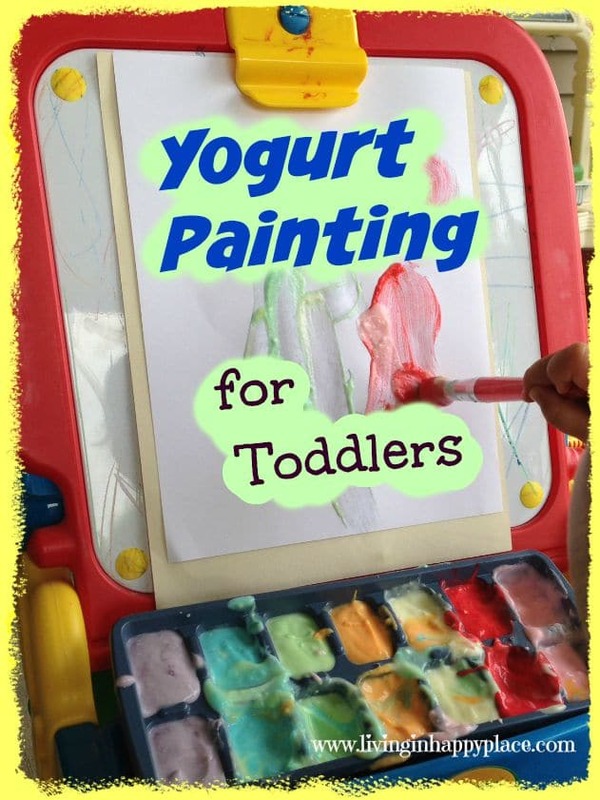 Is your toddler ready for edible yogurt painting? That is such a great idea Heather! Thank you!!! I hope your class enjoys yogurt painting!